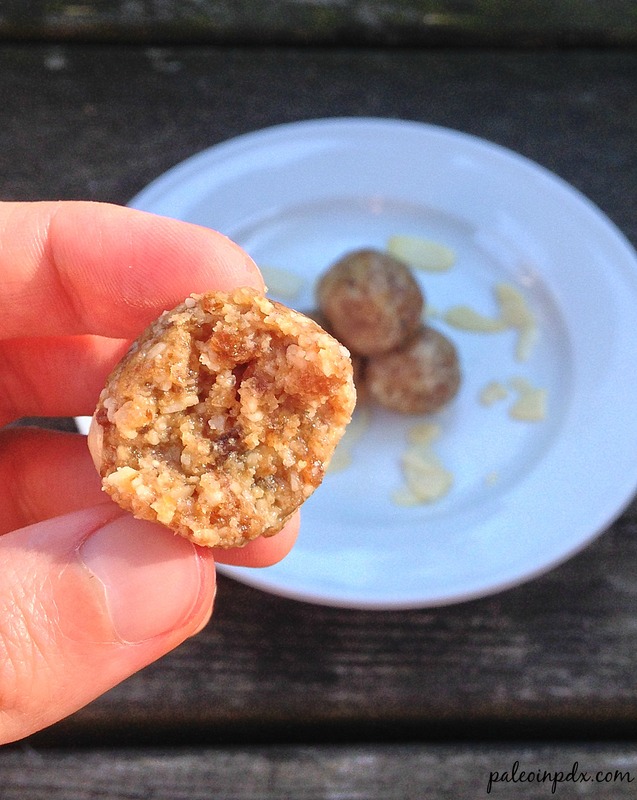 This salted almond bites recipe has been long in coming, and I am finally sharing it. I used to make these for Cultured Caveman here in Portland and they would then sell them at their food cart. I started making them a couple months after they opened their first food cart back in 2012. I always usually had two flavors — this one and a rotating one. The salted almond was always a big hit and also my favorite, which is why it always remained a staple flavor. As Cultured Caveman grew and opened more carts (and now a restaurant too), they took over making these for me instead. My schedule got a bit more hectic and it became easier on both sides for them to take over, so I handed over the reigns this past November. It is still my original recipe though and you can still find them at the carts. Bill and Hayley of Primal Palate even tried them during their visit to Portland and liked them (and posted about it on Facebook). That made me happy and was so cool to see! Meanwhile, these are super easy to make, as long as you have a good food processor (I use this one). They’re great for traveling, kiddos or as a little sweet treat for yourself. They are not a staple by any means, but something to be enjoyed on occasion or shared with others. Feel free to make the bites whatever size you desire. If you’re pressed for time or just prefer it, you can pat the mixture down into a small pan and then cut into squares. Either way, make sure to store these puppies in the refrigerator. Remove pits from dates and place dates in the food processor. Process/blend about 30 seconds or until dates are chopped up and starting to clump together. Then, add the remaining ingredients. Process again until everything is mixed through. You may need to scrape down the sides of the food processor bowl and then blend again. Chill processed mixture in the fridge for 5-10 minutes. Then remove and roll into desired sized bites. I made mine a generous 1/2 Tbsp size. Again, you can pat into a pan and slice into squares too. Quantity will vary deepening on size and shape. Store in the refrigerator. When my body can handle fructose again, I will definitely have to try these! They sound (and look) delicious! Yep, and lots of room for experimenting/creativity with other flavors and additions! I love these little things!! I haven’t had dates in a while (I keep meaning to get some) but I subbed dried cranberries when I made some late last winter. I called them cranberry bliss balls. The basic method is so versatile….I currently have some dried apricots which would probably be good too. 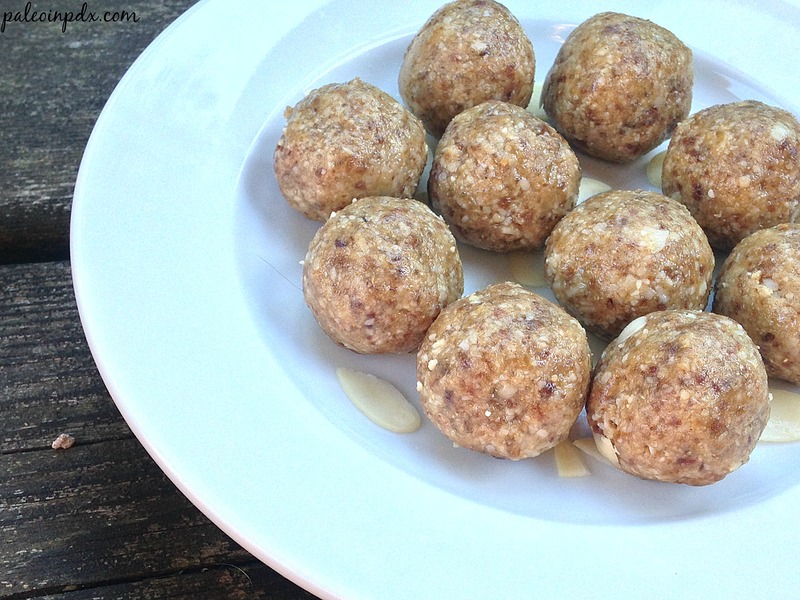 Cranberry bliss balls – those sound great! I’ve never made any with cranberries, but have made some with apricots before. It was apricots, vanilla and cashews, and it tasted like vanilla cake! So tasty!